The annual March for Life rally and demonstration in Washington, D.C. is underway, with thousands of pro-life activists filling the National Mall and the streets to the Supreme Court. Many have included visits to their House and Senate representatives in their plans. 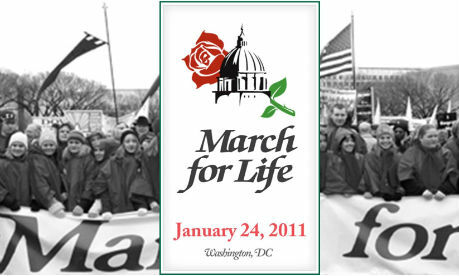 Saturday marked the 38th anniversary of the landmark Roe vs. Wade Supreme Court decision which legalized abortion. House Republican leaders are eager to move on a vote to put more restrictions on federal abortion funding. Rep. Chris Smith (R-N.J.) and other key members of the Congressional Pro-Life Caucus last week introduced the No Taxpayer Funding for Abortion Act, which would prohibit federal agencies and programs from spending tax money to fund abortions. The USCCB strongly supports this measure. Read the letter to Congress signed by Cardinal Daniel N. DiNardo Archbishop of Galveston/Houston, Chairman, Committee on Pro-Life Activities, United States Conference of Catholic Bishops. At present, Smith’s measure has 161 co-sponsors and the public backing of the top GOP leadership. Speaker John Boehner (R-Ohio) has has directed that the legislation be designed as H.R. 3 and called it “one of our highest legislative priorities.” The Senate is not expected to take up the measure, however.